My Dogs Have Saved So Many Lives. Including Mine. I talk about this always, to anyone who asks about our Maremmas - no, they are not guard dogs; they are guardians and, in my eyes, there is a world of difference. 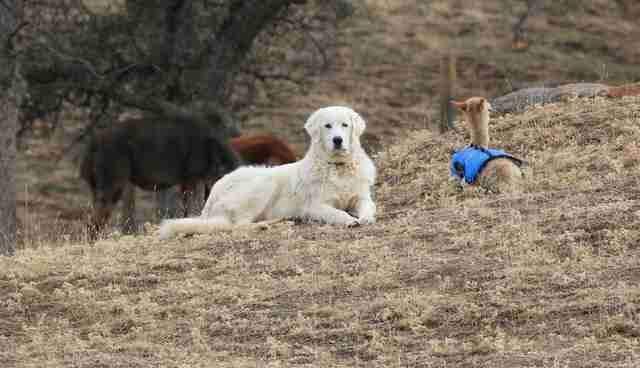 The Maremma is a livestock guardian dog originating in the Maremma-Abruzzo region of Italy; a dog with a job, working with shepherds to protect sheep from wild predators in the mountainous ranges where the flocks graze. 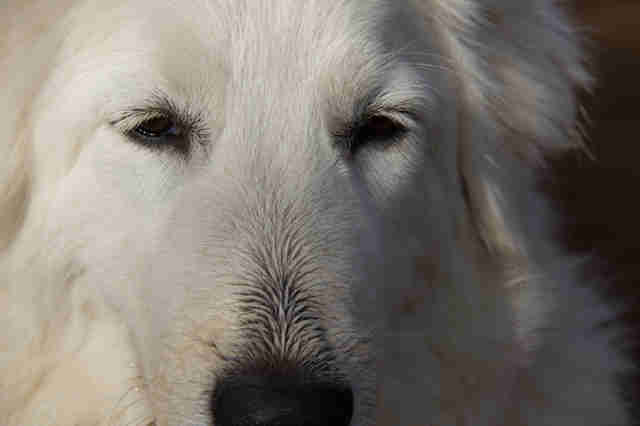 Centuries of careful breeding give the Maremma a dual nature: a great desire to bond and be gentle with its chosen flock and also the ability to act fiercely when faced with predatory threats. They are caretakers with exquisite, often tender, nurturing instincts, but with a host of scare tactics reserved for intruders, assault being the lesser of them. The breed is garnering a bit of attention lately due to the novel efforts of some folks intent on saving a unique colony of little penguins in Australia, specifically Warmambool Harbor, and even more specifically Middle Island, a favorite breeding ground for the little peeps. The island used to be in deep water, but man-made infrastructures put in at the turn of the last century, have caused siltation, giving foxes (and people, who can be a nuisance to natural habitat) a means of crossing to the island at low tide. The end result is that the population of little penguins went from somewhere around 800 in 1999 to under 10 in 2005. Bad deal. 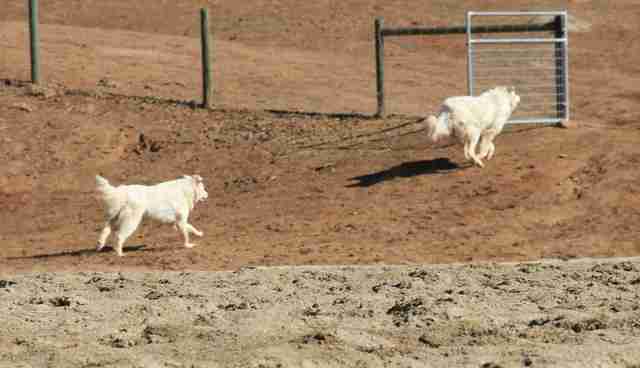 A Maremma named Oddball - and a lot of effort from good people impassioned about the cause - changed all that. No more fox predations and the population of little penguins bubbled up over 100. If you are interested in grass roots information about the project, check out the Warrnambool Penguins website. The Audubon did a fantastic piece about this project which you can find here. I tell you all of this because I am in love with our Maremmas. No hyperbole - in love. We got Sophie and Marco, a sister/brother pair, because we had alpacas, which are vulnerable little creatures, like sheep. Also, we lived on a ranch in the foothills of the Sierra-Nevada Mountains and coyotes pretty much sat on our front doorstep for the humor of it. We put up special fencing to keep predators out, but there was no end to the horror stories we heard about what coyotes and mountain lions were capable of doing anyway, basically thumbing their noses at our fence line. 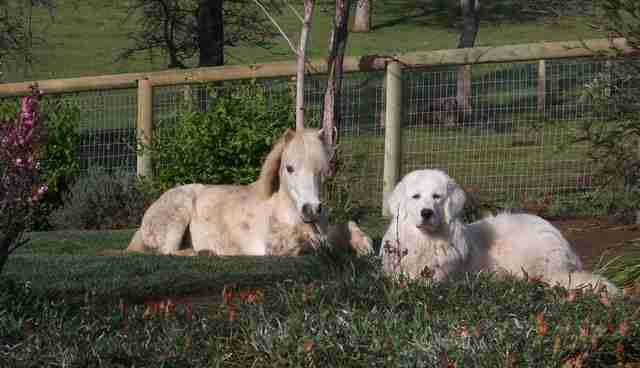 So we researched alternatives and found out about livestock guardians and then, about Maremmas. Now, it is hard to imagine that something that looks like this when you bring it home could be a serious solution to what we were facing. But it was. We worked very hard at socializing our pups to their flock and to us. As they grew, we showed them the boundaries of what we wanted them to protect. They spent a lot of time with the alpacas, but also with the horses and the donkeys and with us; we are all their flock. We socialized, we occasionally corrected over-exuberant behavior, but we did not teach or train. That comes entirely from them. The newest addition to the alpaca herd was just days old when a break in the rain gave us a chance to let the herd out onto the hill for some much needed pasture time. The mamas and babies stuck close together in the pen and we assumed it would be no different in the bigger space. We watched the herd until all seemed settled and went on about our chores. Looking up some time later, we saw that the herd had gone over the hill to seek better grazing near the creek. All of them, that is, except the new baby. And Marco. This vigil went on for 20 minutes or more; Marco, watchful and still; the baby snoozing. When the mamas finally meandered back, Marco ducked his head at their presence, but did not move from his spot until the right mama came over and claimed her baby. Marco, was just a year old, a baby himself. My heart wells up even now when I am reminded of this. Sophie proved she was no slouch at this caretaking thing either. Anyone who knows us, knows about Boo, our granddaughter's first pony, still with us even though he suffers from a metabolic disease that can make life challenging for him - especially when the weather is too hot or too cold. Boo was in a low spell and we had to separate him from the horse herd for his safety and to keep a more watchful eye on him. We settled him in the back yard, checking on him periodically as we went about our (yes, we are always doing them) chores. Apparently, that was insufficient in Sophie's eyes. How she tuned into the situation, I do not know, but she left her post with the alpacas and spent the better part of the afternoon at his side. I was working in the office one day with the dogs laying at my feet when a loud crash vibrated the window. We all jumped and the dogs alarmed, barking loudly. It registered in my mind that it was probably a bird, but the dogs, not waiting for an explanation, went charging out the door at full tilt. Hoping the bird was merely stunned, I scrambled my boots on and following thinking it would need rescue from the dogs. All the dogs were standing at bay, watching Marco who lay with the bird between his paws. 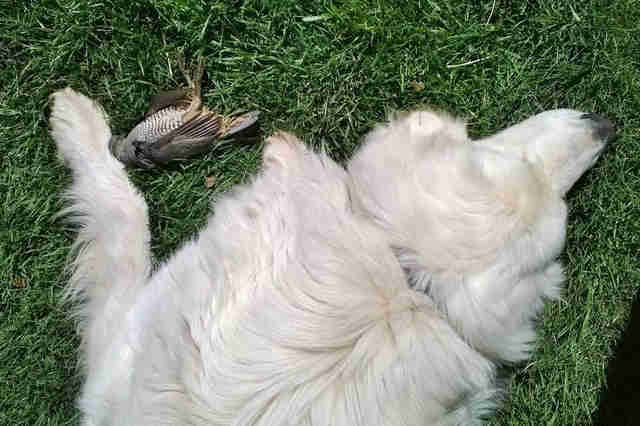 He snuffled it, the bird turned its head toward him, took its last breath and died. Marco gave it a gentle nudge, as if to be certain, and then lay like this for a very long time. I think he was standing guard. This happened, death, on his watch and it was therefore his duty to assure that no predator came and claimed it for a meal and, liking the taste of that, came back for more. Except, it was a bird, not his "flock" and still, his instincts said to hold the space. So we all sat with him and when it seemed a respectful amount of time, he let me take the bird away. 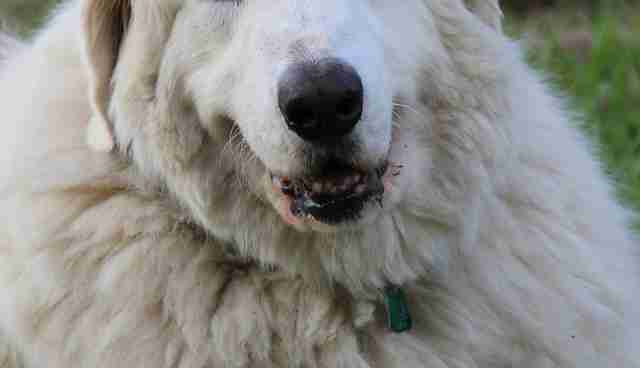 A Maremma's primary strategy against predators is deterrence. Even when you think they are not working they remain alert to smells and sounds. At night, Sophie and Marco greeted any perceived threat with fierce barking and a chase along the fence line. During the day, they applied the silent treatment. One minute, they would be laying in the barnyard and the next, on some secretly exchanged signal, they were at a dead run up the hill. No barking, no noise of warning. I never saw it first, but I learned to pick it up after they alerted: A coyote or, sometimes, a bob cat crossing far up the hill above us. Its distance made it of no threat to us, but the Maremmas knew better than to let a predator saunter through their territory, scoping out options. Sophie is the naturally more cautious of the two; it is high praise to you if she curls up beside your chair at the end of the day. Marco is friendly to everyone, rambling over in a got-all-the-time-in-the-world way, snuffing his head under your hand for a greeting. It would seem a very bad deal indeed if Marco was distrustful of you. I wondered whether there even was such a thing until the day the concrete guy came. I was home alone and the work was to start the next day. He asked to stop by after work to confirm final details and I said "sure." Now ... I wasn't so sure. He stood too close, said inappropriate things. Right about when the hair on the back of my neck stood on end, I saw from the corner of my eye a rapidly approaching white mass. Marco, in silent mode. Now, frankly, I sort of wanted him to back the guy off in a big way, but Marco is a Maremma and his judgment told him to do something else. Instead, he glided in front of me, pressing close and taking my hand in his mouth. Then he fixed both eyes on the concrete guy, lifted his left lip and growled, low and steady. Concrete guy took a step back and then two more. I left my hand in Marco's mouth and used the other to stroke his mighty head. Yup, I'm with him. My husband was the one to get up early the next day to meet the concrete guy and workers. Concrete guy was stuck in his truck because Marco was standing with his nose pressed to the window, growling, low and steady. He never forgets a face. We were so enamored with Marco and Sophie that we found an excuse to squeeze a third one into our lives. Giada was born in a barn and kept with goats until she came to us. I was a bit anxious about going through the whole puppy socialization part again. I need not have worried; Marco and Sophie took over most of the parenting responsibilities. Giada has grown into a fine and charming creature in her own right. She is sweet and very submissive and loves to take care of the smallest and most vulnerable of her flock. Maremmas are not a breed for everyone or every living situation. 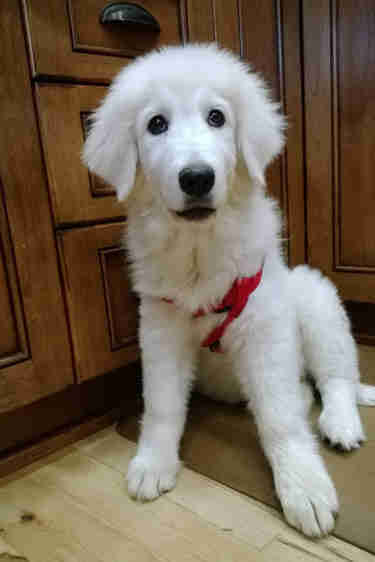 I belong to a Maremma Owners group online and see how more and more people are finding ways to keep these amazing dogs solely as companions. I get that and feel that a huge part of the relationship we have with our three is just that, as companions. We are always mindful, though, of what these dogs are hard-wired to do, the things that give them a sense of purpose, of job. I love that kinship and at the end of the day, I can tell you there is nothing sweeter than knowing this is what is watching over you.